The air is brisk, the leaves are colorful, and the Brunch of Professionals are back in action with a special brunch for the Autumn lovers. So grab your best Fall brunch attire and professional gal pals and join us October 28th for a Latin-Soul food brunch at Snifters Tapas & Spirits. Whether you're a regular attendee or a newcomer, our Autumn Brunch is sure to offer you fruitful and engaging discussions, coupled with mouthwatering brunch dishes, all for a reasonable price. Purchase your tickets TODAY to partake in this brunch experience tailored especially for the busy, professional woman. This month, each ticket includes an entrée, a non-alcoholic beverage, and your choice of a Mimosa or a Michelada. Ladies and gentlemen, join the ladies behind Brunch of Professionals for a special celebratory brunch to mark the finale of YP Week! For the past three years, Brunch of Professionals has provided a social networking space for professionals to meet, greet, and eat at some of Milwaukee's premiere restaurants and eateries. What better way to usher in the sweet Spring and celebrate the end of another successful YP Week than over brunch?! The air is brisk, the leaves are colorful, and the Brunch of Professionals are back in action with a special brunch for the Autumn lovers. The weather is never too chilly for brunch, right? So grab your best Fall brunch attire and professional gal pals and join us November 12th for Spanish fine dining at the cozy Bodegón at Hotel Madrid. Whether you're a regular attendee or a newcomer, our Autumn Brunch is sure to offer you fruitful and engaging discussions, coupled with mouthwatering brunch dishes, all for a reasonable price. During this month's discussion, we'll be tackling the problem with "Locker Room Talk," a ripe discussion point given our current media cycle. What are you waiting for? Purchase your tickets TODAY to partake in this brunch experience tailored especially for the busy, professional woman. Brunch of Professionals is excited to team up with NEWaukee, and Summerfest for the Live Band Brunch, a grand finale to the 50th edition of the festival! Join us on the last day of Summerfest, Sunday, July 9th, as we close out the festival with the only way #BrunchPros know how - with a fabulous brunch in the BMO Harris VIP Section, a backstage Summerfest venue surrounded on two sides by beautiful Lake Michigan. Brunch is open to ladies AND gentlemen! Private access to the BMO VIP backstage area from 12 – 2 p.m. Featured entertainment will be provided by local jazz musician and Gibraltar owner, Evan Christian. Tickets are limited for this exclusive, one-time experience, so purchase yours today! You must be 21 years or older to participate. Mother's Day is quickly approaching and Brunch of Professionals is once again hosting something special to honor mothers, mothers-to-be, and mother-figures - our second annual Mother's Day Brunch! Want to celebrate the special woman in your life over fun and engaging conversation, all while beating the Mother's Day crowds and enjoying delectable eats? Then this brunch is for you! In an added twist, this year's Mother's Day Brunch is co-ed, meaning men are also welcome to bring the special woman or women in their lives to join the celebration. Each ticket includes your choice of an entree, a non-alcoholic beverage, and digital photography by Chris Siegel Multimedia. Space is extremely limited, so don't delay - purchase your tickets today! Can you believe that Brunch of Professionals turns two years old this month?! We're celebrating the only way we know how - with a brunch in the transforming Walker's Point neighborhood + one FREE mimosa with each ticket purchase. Social Media has come a long way in just a few short years. Once thought of as taboo in the workplace, companies (and people) have evolved to not only embracing social media platforms, but fully utilizing them to their benefit. But is our new obsession with a social media driven world really all it's cracked up to be? Are quick tweets and aesthetically pleasing photographs on Instagram building our brands, or slowly destroying them? Is the ability to carefully control your image on various platforms helpful or harmful? How has (or will) social media change(d) us and the way we do business? Garner insight on these topics and more during a fruitful discussion, ripe with articles and examples, at this month's brunch entitled: The Power of Social Media. We're baacckk! It may be cold outside, but we're heating things up at the former firehouse turned chic restaurant, Engine Company No. 3. The year is new, but our brunch gatherings for Wisconsin professional women are still the same - great gals, great food, and great conversation. Have you ever been pulled into a political argument at work? How do you stay true to yourself and the causes you care about while working in an environment that doesn't share your views? Do you think politics and activism can be discussed in the workplace, or are they largely taboo? Share your thoughts and hear from others during this month's discussion entitled: Navigating Politics & Activism in the Workplace. Tickets are limited, so purchase your ticket today! Make-up touch ups courtesy of Style by R.
To celebrate the beginning of summer, Brunch of Professionals is headed back to the basics, but with a New Orleans twist! Join us this month at Brass Alley as we delve into brunch options reminiscent of a walk down Bourbon Street. Bring your business cards and positive energy, as we continue to facilitate career focused discussions with fellow women professionals. We welcome women of all professional backgrounds to join in on the fun. Purchase your ticket today to usher in the summer with Brunch of Professionals! This month, our brunch is dedicated to mothers! In honor of Mother's Day, we encourage our Brunch Pros to bring their mothers, grandmothers, or any other mother-figure they would like to honor and celebrate. Tickets include your choice of an entree and a non-alcoholic beverage. Tickets are limited, so please purchase your ticket today! You are cordially invited to paint your spring PURPLE! Brunch of Professionals, in partnership with the American Cancer Society (ACS), invites you to attend the annual Survivor Brunch on April 16, 2016 at Hotel Metro in downtown Milwaukee. Please join us in honoring the men and women survivors of cancer through this celebratory brunch! We encourage all attendees to wear purple in our efforts to raise cancer awareness. Can't attend? Please consider giving generously in support of this philanthropic brunch. With your donation, we can assist ACS in its fight for more cancer research and education to find viable cures and treatment. MAKE A DONATION OR PURCHASE YOUR TICKETS TODAY! It's a CELEBRATION, Brunch Pros! Ladies AND Gentlemen, please join us Saturday, March 26th as we usher in Spring and celebrate our very FIRST birthday! You read that correctly - we are toasting to one whole year of brunches with a celebratory CO-ED brunch celebration and want YOU to join us. This month, we're giving you everything that you love about our monthly brunches, but with even MORE of the fun! Bottomless mimosas, gifts and prizes, delectable food options, and of course, rousing conversations and invaluable networking with your favorite Brunch Pros AND our featured guests! What are you waiting for? Another month, another brunch! Join us the last Saturday of February for Brunch in Walker's Point at Black Sheep. The brunch will feature some of Milwaukee's talented professional women, engaging conversations (including a specific talking point centered around professional development), and of course, mouthwatering meals (and a mimosas while supplies last). So what are you waiting for? Purchase your ticket today! Happy New Year and welcome back, Brunch Pros! Brunch of Professionals is starting the new year off with a fun twist on the traditional brunch at Rustico in the Third Ward. It's a new year, but our format is the same: good food, good company, and good conversation. Whether you're a seasoned Brunch Pro or you're newly interested in joining our monthly brunches, we encourage you to purchase your ticket today, and join us this month! In lieu of our November brunch, and in honor of the Thanksgiving holiday season, the ladies of Brunch of Professionals are hosting a Brunch at Night at Joy House, a Milwaukee homeless shelter for women and children, on Wednesday, November 18th at 5:00 pm. Thanks to the generous donations of some Milwaukee-area restaurants, we are able to provide approximately 70 women and children with a delicious meal for the evening. At this time, all volunteer spots for this event have been filled. As the weather cools down and the holiday season quickly approaches, we present to you our FINAL brunch of 2015 - Brunch in the Lower Eastside at Trocadero. You read that correctly - our FINAL brunch of 2015! Here at Brunch of Professionals, we value the family oriented months of November and December - so why not spend your October brunchin' with your Brunch of Professional family one more time before the close of the year?! Join us for an array of appetizing dishes, and as always, a riveting conversation with some of your favorite Milwaukee area professional women. After a successful Anniversary co-Ed brunch, we're taking our #BrunchPros up on their recommendation and taking over the tucked away neighborhood of Story Hill! Indulge in Story Hill BKC's unique take on brunch and engage in meaningful conversation with our #BrunchPros! Tickets and space are limited, so purchase your ticket HERE today! To commemorate our 6th month anniversary, the Brunch of Professionals are bringing you a very special CO-ED celebration brunch in the heart of Bay View. You read that correctly - exclusively for the month of August, we're also inviting Milwaukee-area professional MEN to join in on the brunch fun! We're STILL giving you the same great brunch options and conversation, but with MORE drinks, MORE group diversity, a special GIFT, and a special giveaway! You definitely do NOT want to miss this special brunch! Tickets and space are limited, and previous brunches have sold out quickly, so purchase yours HERE today! This June, we're taking a break from the traditional eggs, bacon, and pancakes, and taking our palates to Milwaukee's little slice of Spain! Ladies, join us for our exclusive June brunch at the upscale Spanish experience, Movida in Walker's Point. Reconnect with your favorite Milwaukee-area professionals (our #BrunchPros), enjoy a tasty meal in the heart of the Fifth Ward, and let your voice be heard in a meaningful conversation centering around our June topic (TBA). 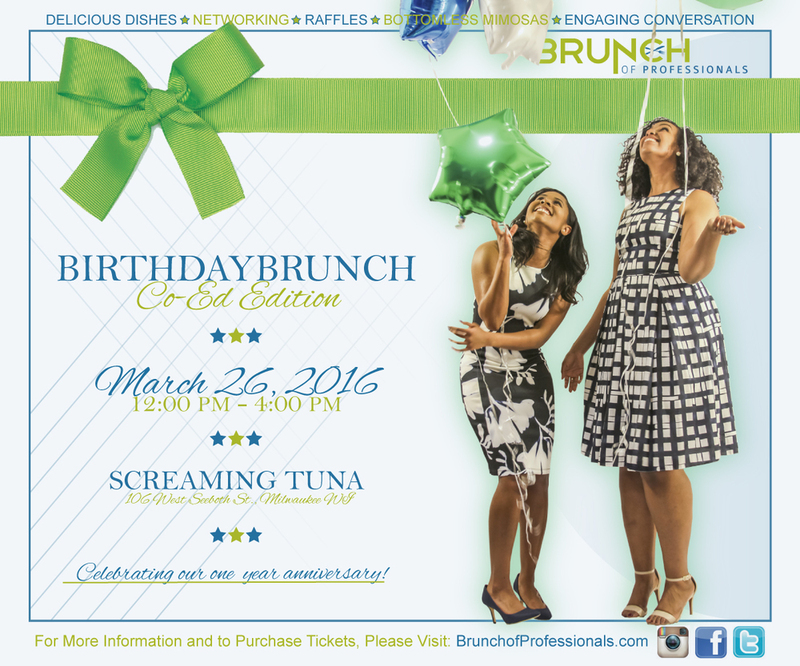 Take it from our #BrunchPros - you will certainly enjoy yourself! Tickets and space are limited, and purchase yours HERE! Can you believe we're already on our THIRD brunch this year?! You may have heard about our fabulous brunches, so why not come to see what all the hype is about? Ladies, join us for our exclusive May brunch at The Knick in East Town. Gain insights into BoP, cultivate relationships with other Milwaukee-area professionals (our #BrunchPros), and let your voice be heard in a meaningful conversation centering around our May topic (TBA). Take it from our #BrunchPros - you will certainly enjoy yourself! Tickets and space are limited, so purchase yours today HERE! Ladies, join us for our exclusive April brunch at Louise's in Cathedral Square. Learn more about BoP, meet other Milwaukee-area professionals, and enjoy the brunch Louise's has to offer. You will leave our brunch well on your way to becoming a certified Brunch Pro! After months of preparation, we are excited to announce our very first exclusive brunch event! Join us in celebration of our first event, which includes complimentary mimosa on us. Learn more about BoP, meet other Milwaukee-area professionals, and choose from a specialized brunch menu at the award-winning Coquette Cafe in the Historic Third Ward. You will leave our brunch well on your way to becoming a certified #BrunchPro!